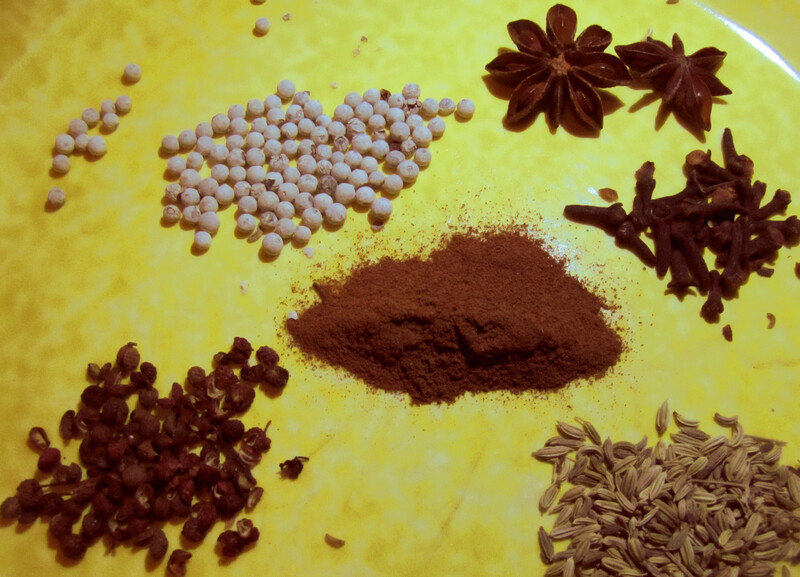 Chinese five spice is one of the most common spice blends used across China, and can be a powder, or a combination of whole spices added while cooking (as in poached chicken, or red braising). There’s variation in the spices used, and a given five spice might have more, or fewer, than five spices. Typically, five spice will have some combination of fennel, cinnamon, star anise, Sichuan pepper. It might also have white pepper, dried ginger, licorice root, and cloves. You can buy the pre-ground mix readily enough, but there are a few reasons you might want to make your own, fresh, from whole spices, including flavour. The following recipe is basic, and includes equal amounts of all the whole spices. Play with it, as you see fit! I included ground cinnamon, instead of whole, because I hate grinding it in a mortar and pestle. Lightly toast the whole spices in a hot pan, starting with the cloves and the pepper, and finishing with the fennel seed. As soon as the spices are fragrant, grind them finely. If you want to make sure the powder is very fine, you can sift it, but I normally don’t bother. I highly recommend checking the Sichuan pepper for seeds before using. The little black seeds have an unpleasant sandy texture when ground.